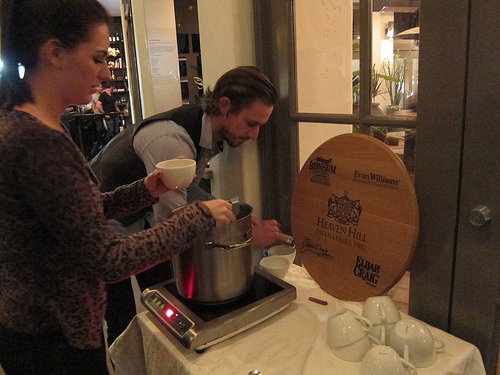 As it gets a bit chillier in the evenings, a whiskey dinner sounds pretty amazing. I was invited to Areal in Santa Monica in December to check out the whiskeys of Heaven Hill. There will be another Heaven Hill whiskey dinner at Cafe del Rey in Marina Del Rey on Thursday, February 7. Get more info here. I had always meant to get over to Areal. I was curious to see how they transformed the old World Cafe where I spent many nights bar hopping on Main Street. 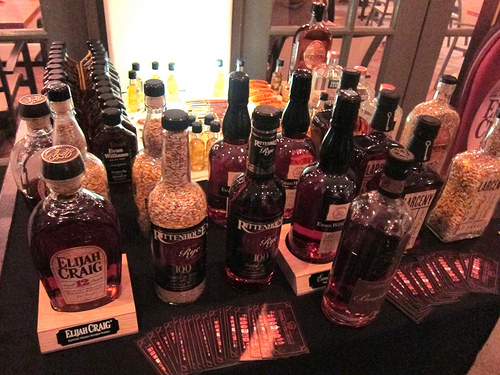 I knew Heaven Hill made a few whiskeys I liked including Elijiah Craig and Rittenhouse. 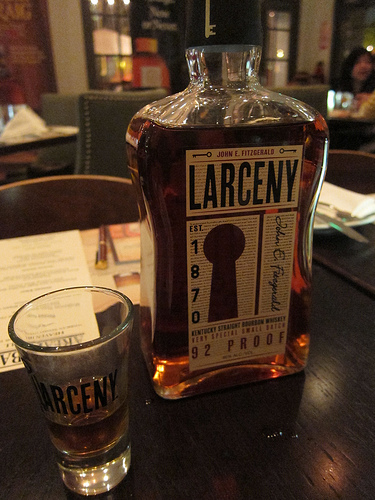 I was excited to learn more about Larceny which I was only recently introduced to. Heaven Hill makes all types of American whiskey including straight bourbon, straight wheat, straight rye, corn and wheated bourbon. 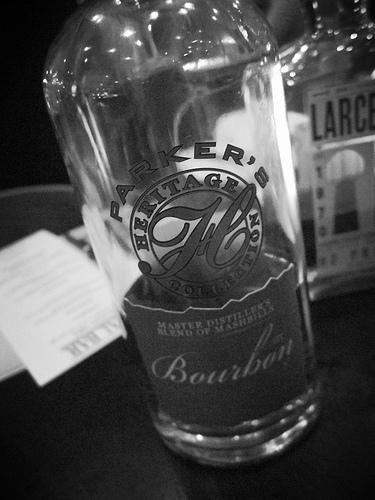 Besides the paired cocktails, we also had a chance to sip a few remarkable and exciting spirits including Parker’s Heritage bourbon. The Parker’s Heritage collection are limited edition whiskeys that are hand selected by distiller Parker Beam. He’s been a distiller of 45+ years who learned how to make bourbon and other whiskeys at his father’s side. Recently he was diagnosed ALS (better known as Lou Gehrig’s disease). Here’s a page to help or donate. 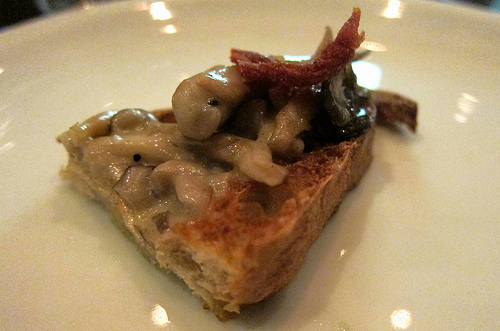 We started off with mushroom toast with goat cream and crispy speck. This was paired with a hot whiskey punch with Elijah Craig 12 Year Bourbon. 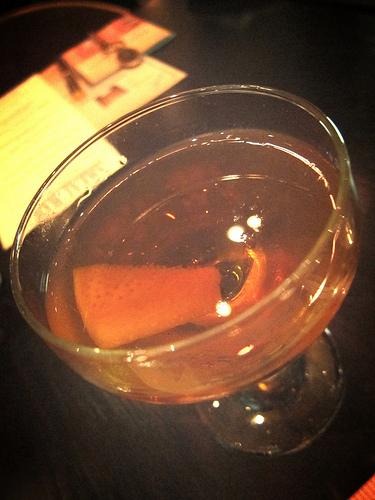 Head bartender Adam George Fournier thought this would warm us up on a rainy night and it did. I thought about a second glass but I knew more was coming. What was so great about this dinner was it was also educational. Heaven Hill On-Premise Area Manager Andie Brokaw was on hand to describe the whiskeys and give us further background. Course two came out and we were ready for a cocktail. The quail was stuffed with persimmon and sage which Adam George worked into his Persistence cocktail. The Evan Williams Single Barrel Bourbon had persimmon, all spice and orange. It was one of my favorite cocktails this evening. What I like about the cocktail menu at Areal is it’s divided into three categories; The Starter Kit, the 5-Minute list and the 10-minute list. The starter cocktails are a mix of classic cocktails such as American Trilogy, Preakness and Death in the Afternoon and some variations of classics like the Honeysuckle- a daiquiri with honey. The 5-minute list is also titled “Let’s Experiment” which shows off some really interesting originals. The Earth & Sea with Zaya rum, Cocchi Americano, Cynar, Campari and bitters sound right up my alley. Moving on to the 10-Minute list aka “now we’re just showing off” menu, I spotted the Walking Dead which has navy strength Jamaican rum. I’m always interested in overproof cocktails. This tiki style cocktail comes with a warning there’s only 2 per customer. 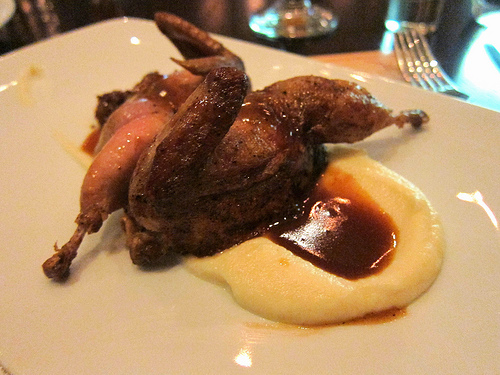 I laugh every time I see whole quails sitting so innocently on a plate waiting to be devoured. But I took my time though carving up the little bird, pausing to take bites from the celery root puree, mixing the near-blood colored gravy in. What a juicy little thing that was. The Pinewood Derby (Rittenhouse 100 rye, Green Chartreuse, Zirbenz stone pine liqueur, bitters) was barrel-aged for approximately 50 days. This was my favorite cocktail of the night. The rye and Chartreuse had mellowed out a bit in the barrel. Zirbenz which is pretty distinctive also blended easily into the cocktail. It’s available on the regular menu… that is if, Adam George made enough. Hopefully he barrel-aged a big batch. Recently Executive Chef Mette Williams (Cut, Spago, Lexington Social House) accepted a position at Culina. I don’t know if the menu at Areal has changed since her departure but this meal she prepared for the Heaven Hill whiskeys was wonderful. 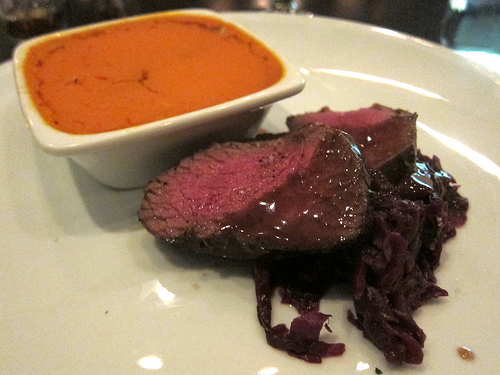 I particularly liked the venison with sweet potato shepard’s pie. I was thinking about the pioneer days of America and how settlers probably had game meats and possibly a bit of moonshine. More on that in a bit. As mentioned, Larceny is relatively new to me. It’s 92 proof so it’s great on the rocks or sipped neat. 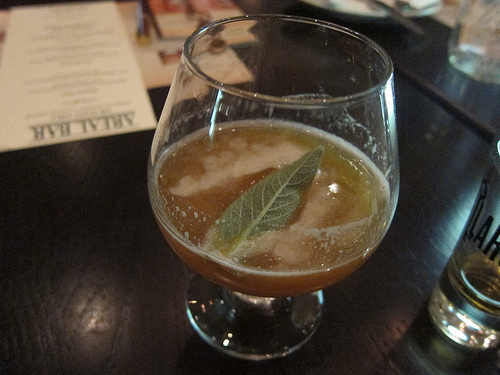 We enjoyed it as a cocktail called Dated Reference (Larceny, amber dates, orgeat, house-made apple cider, nutmeg). This is normally made with Elijah Craig 12 and is found on the regular cocktail menu. Adam George was inspired by a cocktail he came up with while at a friend’s party. The dates were a brilliant addition. I thought it was really cool Andie brought out bottles showing the mashbills of the spirits. Bourbon by law has to be 51% corn to be called bourbon. Most bourbons are more. 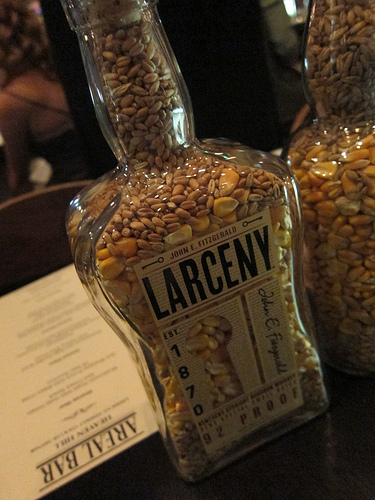 As you can see, Larceny is mostly corn with a bit of barley and rye. 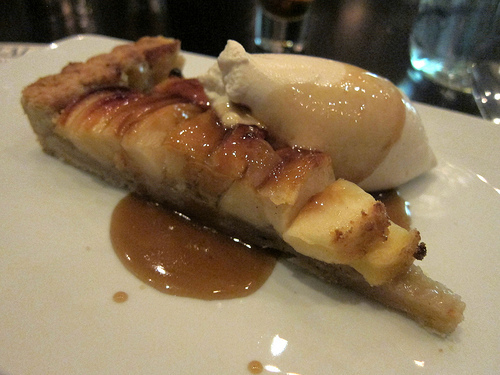 Originally Areal was going to serve a different dessert but I’m glad we got the apple tart. Simple desserts highlighting the booze works for me. 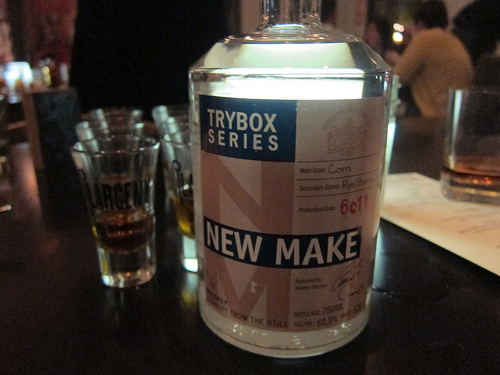 The Trybox series gives whiskey drinkers a chance to try spirits right off the still. These “white dogs” are unaged whiskeys. We tried the New Make which is what Evan Williams is before it’s barreled. There’s also the Rye New Make which if was barreled would be Rittenhouse. This was a very informative dinner and I highly recommend the next one Heaven Hill dinner at Cafe Del Rey in a couple of days. In the meantime, I’ll have to find my way back to Areal to taste more of the cocktails.